I would like to put a gun rack on the passenger side of my 18 ft. Checkmate. Could you quote me on the cost of a quadruple. I have mostly andre wood guns mid and rear handle. 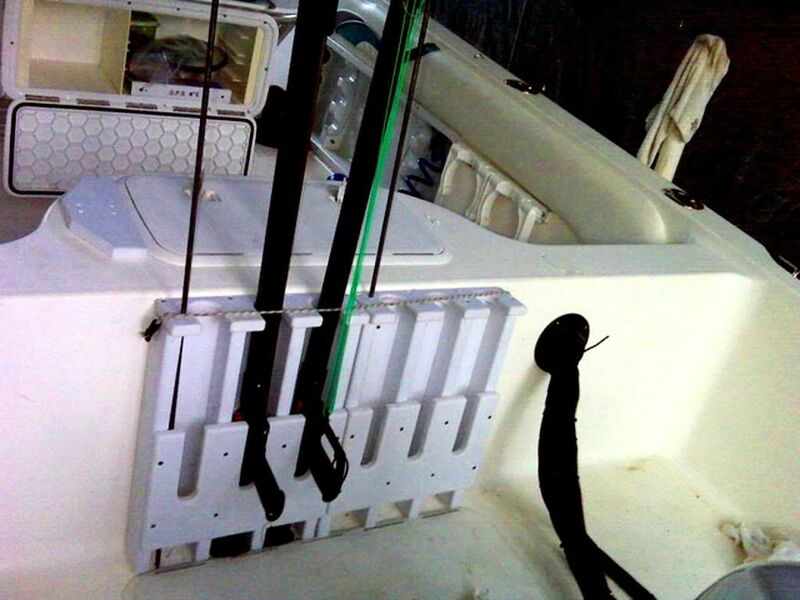 Hi there, here is a stern mounted rack I made for a commercial diver up in tampa. he loves it. You can feel free to call me with any questions you have on the racks. This is a thread with some pics of my racks. You have an email address i can send you a pic. Ive modified the layout a bit by adding rear facing seating with storage space under, and added a 66L gas tank to midships. Hi. Do you have anything for 4 guns on a 15 Whaler Super Sport? Ok and give me the measurements with the free shafts on the gun buddy. And how many guns do you want it for? Pretty much same gun rack but the gun slots will need to be wide enough for a sea hornet gun with a freeshaft on eather side of the gun. I can send pics of the gun if you need. No electronics box yet. I have a new boat now so I will need a box and another gun rack. I'll get measurements for the box. How much for both?